Today is the Feast Day of St. John, Apostle and Evangelist. St. John was a son of Zebedee and brother of James the elder (whose festival day is July 25). John was among the first disciples to be called by Jesus (Matthew 4:18-22) and became known as “the disciple whom Jesus loved,” as he refers to himself in the Gospel that bears his name (e.g., John 21:20). Of the Twelve, John alone did not forsake Jesus in the hours of His suffering and death. 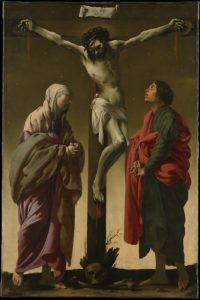 With the faithful women, he stood at the cross, where our Lord made him the guardian of His mother. After Pentecost, John spent his ministry in Jerusalem and at Ephesus, where tradition says he was bishop. He wrote the fourth Gospel, the three Epistles that bear his name, and the book of Revelation. Especially memorable in his Gospel are the account of the wedding at Cana (John 2:1-12), the “Gospel in a nutshell” (John 3:16), Jesus’ saying about the Good Shepherd (John 10:11-16), the raising of Lazarus from the dead (John 11), and Jesus’ encounter with Mary Magdalene on Easter morning (John 20:11-18). According to tradition, John was banished to the island of Patmos (off the coast of Asia Minor) by the Roman emperor Domitian. John lived to a very old age, surviving all the apostles, and died at Ephesus around 100 AD. Yesterday we commemorated St. Stephen, the first Martyr. Today we remember John, who was willing to suffer martyrdom for Jesus, but died of natural causes. Tomorrow we will remember the children who were martyred by Herod in his vain attempt to kill Jesus (Matthew 2:16-18). These three stories weave together three possible outcomes of following Christ into death and heaven. Stephen was a martyr in will and deed. John was a martyr in will, but not in deed. The Holy Innocents were martyrs in deed but not in will, being too young to make a conscious choice. Appropriate prayers for the day include prayers for the work of the new creation in us; for the spirit of awe and reverence in the presence of God; for a glimpse of the glory of God in Jesus Christ; and for increased knowledge of the incarnation.